On this page you will find the complete magazine in downloadable PDF format along with links to supplementary web content. We invite your feedback. Address one of the topics below, or introduce your own. 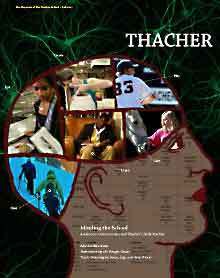 What did you like or dislike about the most recent issue of Thacher magazine? How could the magazine's web pages better serve you? What topics and/or themes would you like to see addressed in future issues?